Next step is to print the card and cut along the outer dotted lines. Then fold the card on the middle dotted line. Oseltamivir (Tamiflu) is indicated for the treatment and prevention of infections due to influenza A and B viruses. Common adverse drug reactions (ADRs) associated with oseltamivir therapy (occurring in over 1 percent of clinical trial participants) include: nausea, vomiting, diarrhea, abdominal pain, and headache. Rare ADRs include: hepatitis and elevated liver enzymes, rash, allergic reactions including anaphylaxis, and Stevens–Johnson syndrome. This is Not Insurance. This is Not Intended as a Substitute for Insurance. Discounts are only available at participating pharmacies. 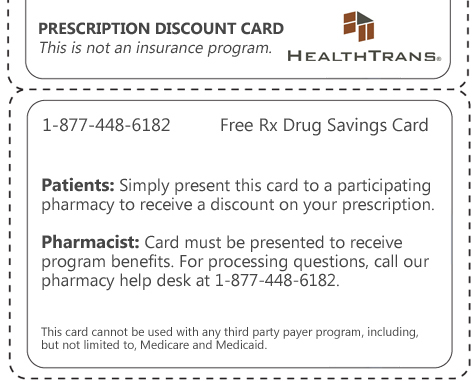 Pharmacist Information: This is a discount prescription card designed to give the card holder discounts on prescription drugs. Please take the above processing codes and enter into your system with our card holders prescription information.